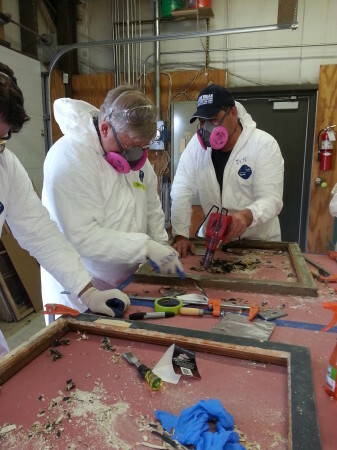 On April 25 & 26th, The Des Moines Rehabbers Club hosted a window restoration workshop taught by guest instructor, David Wadsworth of Wadsworth Construction. 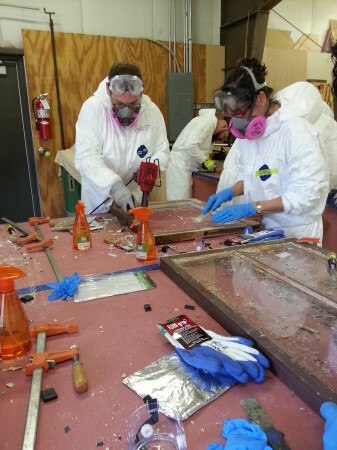 Twenty restoration enthusiasts from across the state came to learn all the steps of restoring a double hung wood window from start to finish. We were pleased that the class included people from Main Street development groups, and at least one statewide preservation organization. All of our participants were enthusiastic and eager to jump in, so the class was a lot of fun! 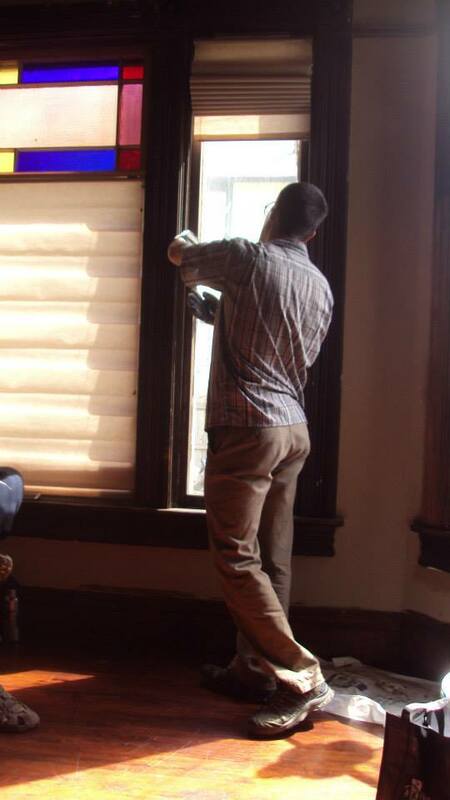 David began the instruction at Historic Hatton House, which was our host site for demonstration windows. Homeowner Tanya Keith had provided David with some sashes in advance and prepped a second window so David could demonstrate how to remove a window. 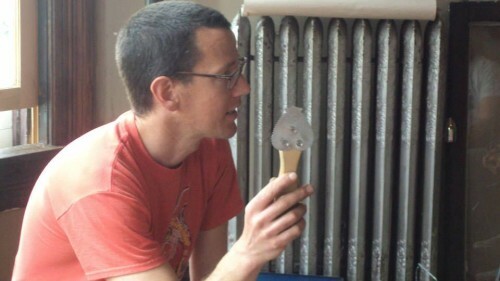 The tool David is seen holding here is called a window opening blade. 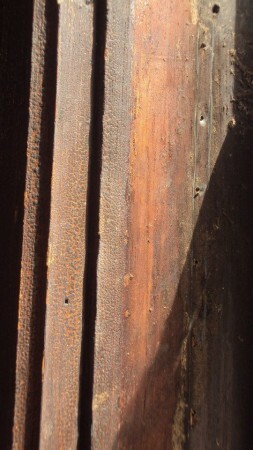 Its serrated edges go between the sash and the frame, scraping away built up paint on a window that’s been painted shut. 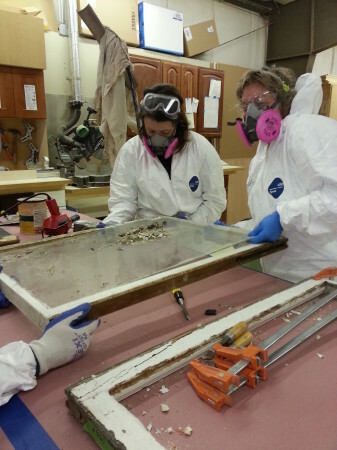 David demonstrated how to pull the stops off the front of the window to release the sashes from the frame. 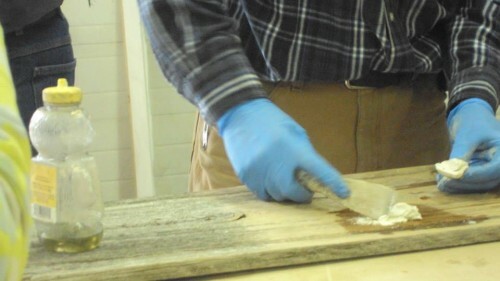 This sash he pulled out would need to have the paint removed, the wood repaired, new glazing compound, stain, and sealant. We got hands-on training on all of those steps, as well as instructions about how to prepare the frame the sashes would go back into. 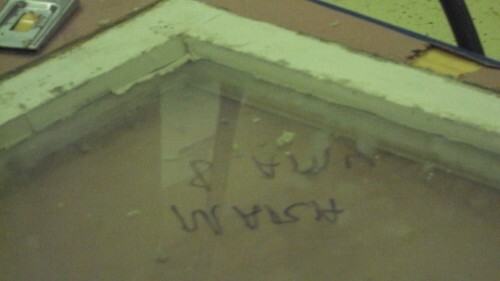 This is what the window frame looked like. Tanya has refinished other parts of the woodwork in her house and explained that this is shellac varnish. The bumpy dark parts will come off with denatured alcohol, steel wool, and rags. 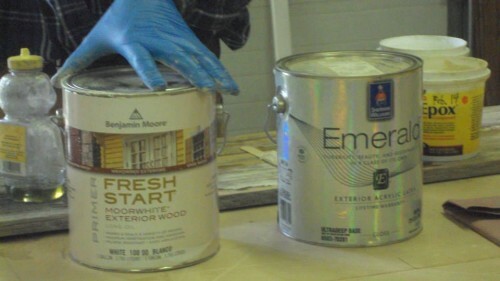 Then it can be refinished with the stain and sealant of your choice. 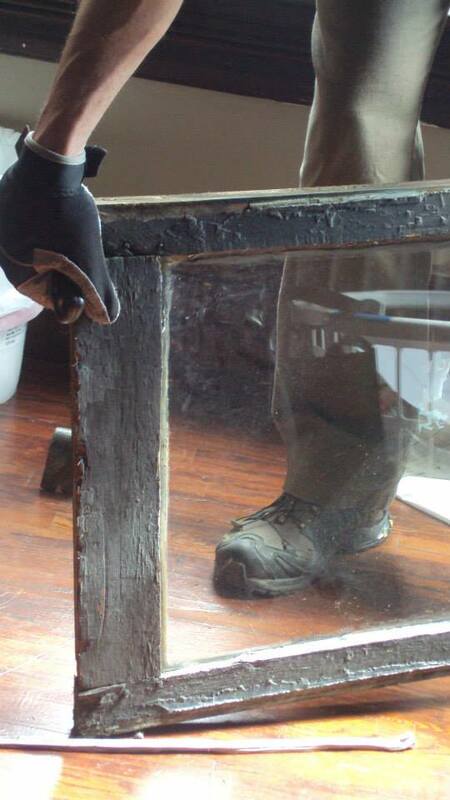 Not all woodwork of this age or condition is shellac, but a good way to find out is to test denatured alcohol on it. If that takes the finish off then you know you’ve got shellac. If it doesn’t, you’ll have to use another method of chemical, heat, or sanding to strip and refinish it. 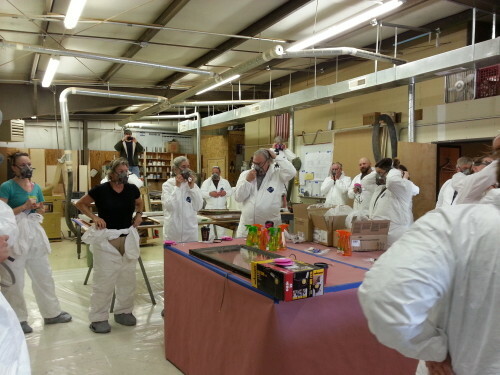 Once we had the window sashes out we moved the whole class to Silent Rivers Design + Build. They generously opened their workshop for us. 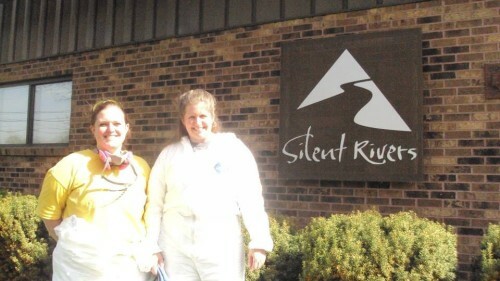 We handed out Tyvek suits to everyone since we’d be disturbing a lot of lead paint dust. We also provided lead-safe respirators. Step one was paint removal. 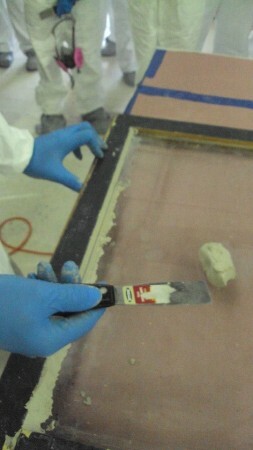 David demonstrated two methods of paint removal. 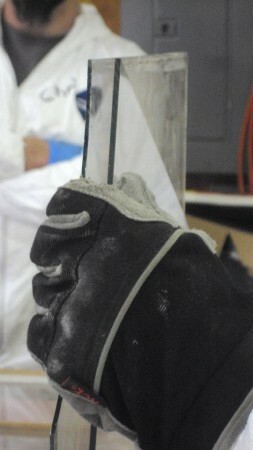 These methods also worked to remove the old glazing putty too. We needed to get the windows stripped down so we could remove the glass and put new glazing compound in to make a good seal. One method was to use heat guns to soften the paint so it could be scraped. The other method used a homemade steaming device that loosed the paint without releasing harmful fumes into the air.David has a steam box that he puts window sashes into at his shop. 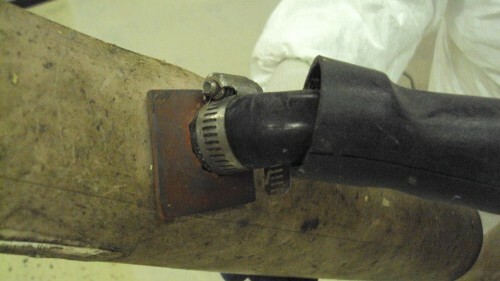 This homemade steamer is made from a clothing steamer, a section of plastic pipe, some bolts to hold it all together, and a large towel to trap the steam. 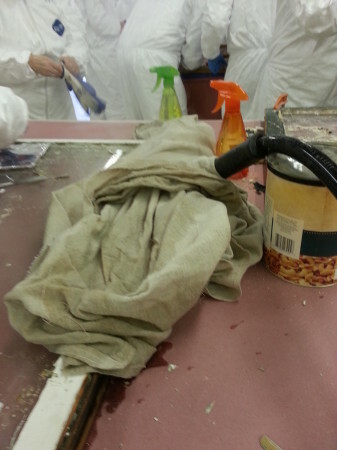 David says that leaving a section to steam for about 20 minutes will soften most paint enough to scrape. Once the old paint and glazing putty were removed David demonstrated re-setting the glass in the window and applying new glazing compound to create a weather-repellent seal. 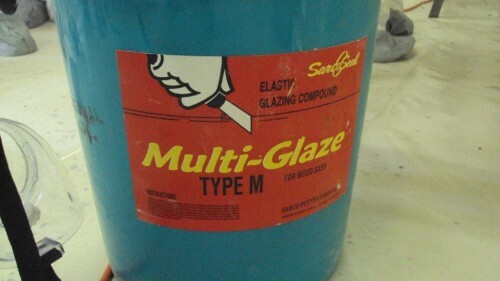 Our class participants tried their hand at applying glazing compound. We learned the difference between two commonly available window glass options. If the window sash allows for the extra space, double thickness glass is often recommended. 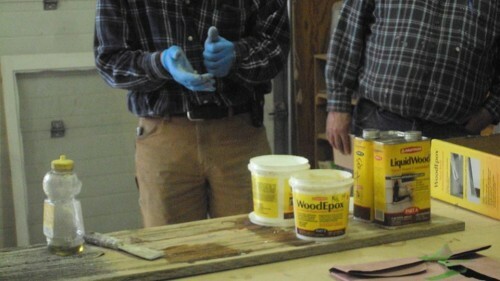 After we learned about glazing, David gave us a demonstration on restoring old weathered wood using a two-part epoxy treatment from Abatron. 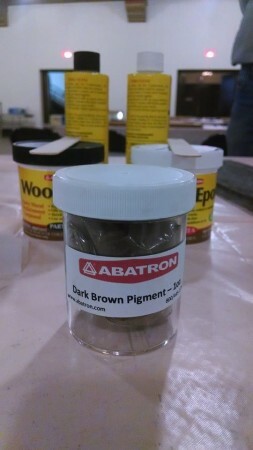 Apparently, the epoxy can be colored with powdered pigment if you want to stain it to match, rather than painting over it. 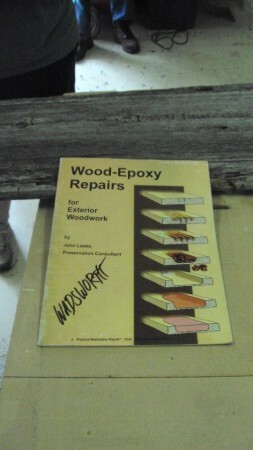 David’s favorite go-to book about wood epoxy repair is “Wood-Epoxy Repairs” by John Leeke. David’s preferred paint for windows is Benjamin Moore Fresh Start Primer and Sherwin Williams Emerald Exterior Acrylic Latex. Back at the Hatton House we learned about re-installing the window, including some tips for making pulley wheels less squeaky. 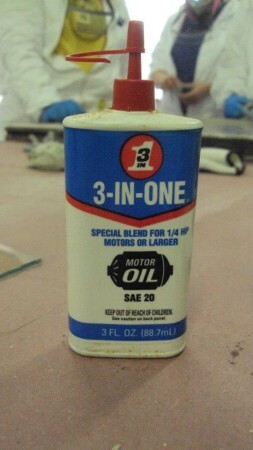 David recommends 3-in-1 Oil.